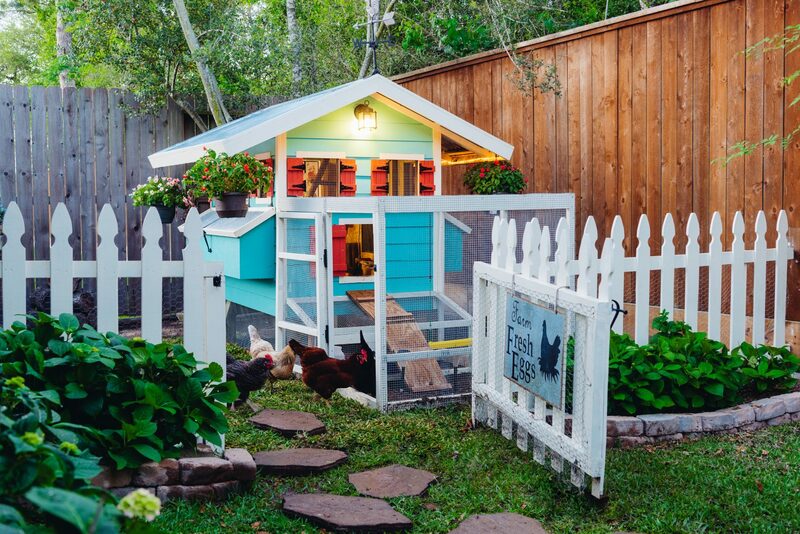 So the big question I am asked all the time: How did you build your backyard chicken coop? 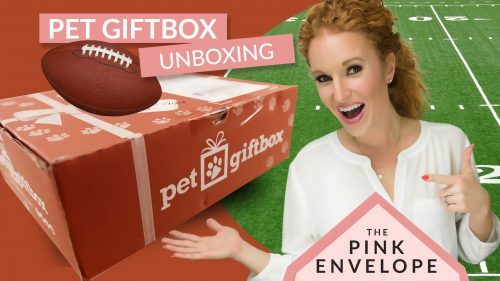 I bought the plans online after a several day binge on Pinterest that I thought was workable and close to what I wanted. 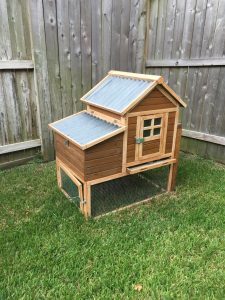 My husband brought in a team and they tweaked the plans to create the perfect chicken coop! Now all my feather babies, big and small, live inside their mansion and it's wonderful. It looks so cute in my backyard and it is the perfect fit for my small space. You can find and buy plans online very cheap, I think mine was $25 and it was thorough but not perfect which is why we had a real team to built it. This thing is so heavy, it is essentially a mini house and takes 6+ men to move it but this is a good thing because it is safe and secure in storms and against predators of all sizes. If you have predators check out websites on how to build your chicken wire into the ground so animals can't dig in and reach under. 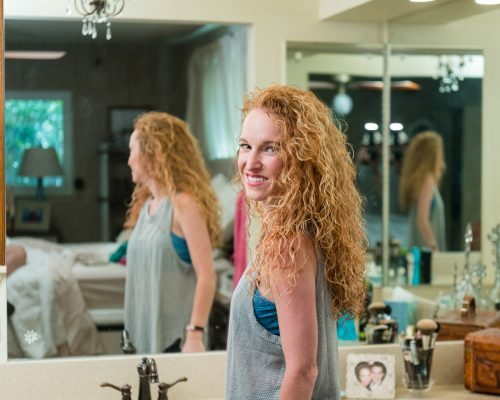 Next question: How did you decide to design and style it? 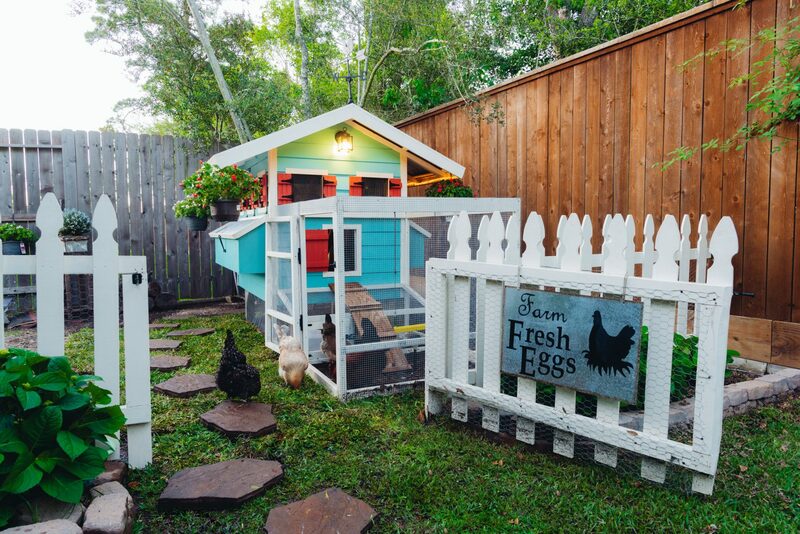 The style was partially from the original coop and in part by what was available and part by the shape of our yard. Most of the supplies came from Lowes and Home Depot. They have tons of hinges, fun paint colors, flowers, sod, and fence supplies. 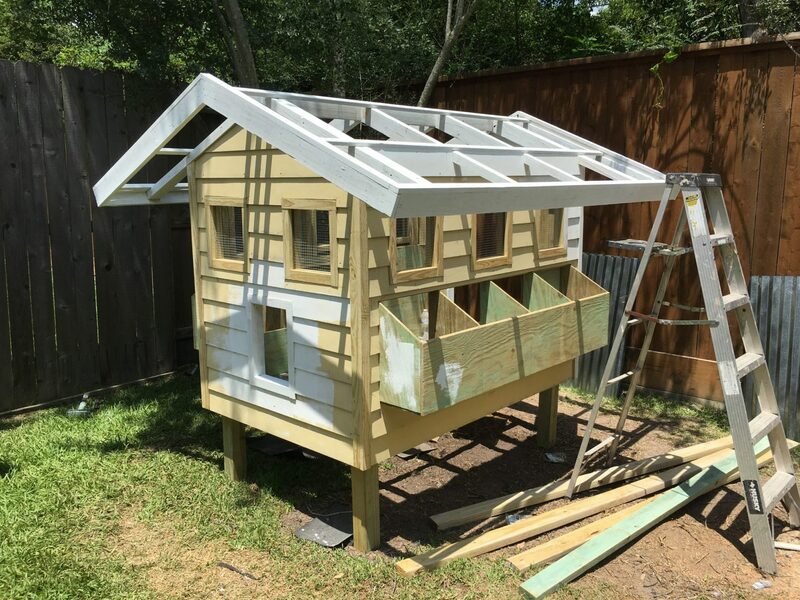 The paint colors we chose are similar to the original coop. The hinges we chose are black and the best price at the hardware store. We took away the plan's little fence and added in the big fence. We removed the star and placed a working light. The sign hanging on the fence we picked up at a local outdoor market and the vintage ladder inside we found at an antique shop. And the big door on the back was fully painted by my kids, so it has hand prints, names and all sorts of beautiful personalized things on it. So all in all, create the coop you want! Next question: What is the maintenance like? Soooo we wash everything with a power washer so we bought durable paints and products that can withstand the elements and a good cleaning. 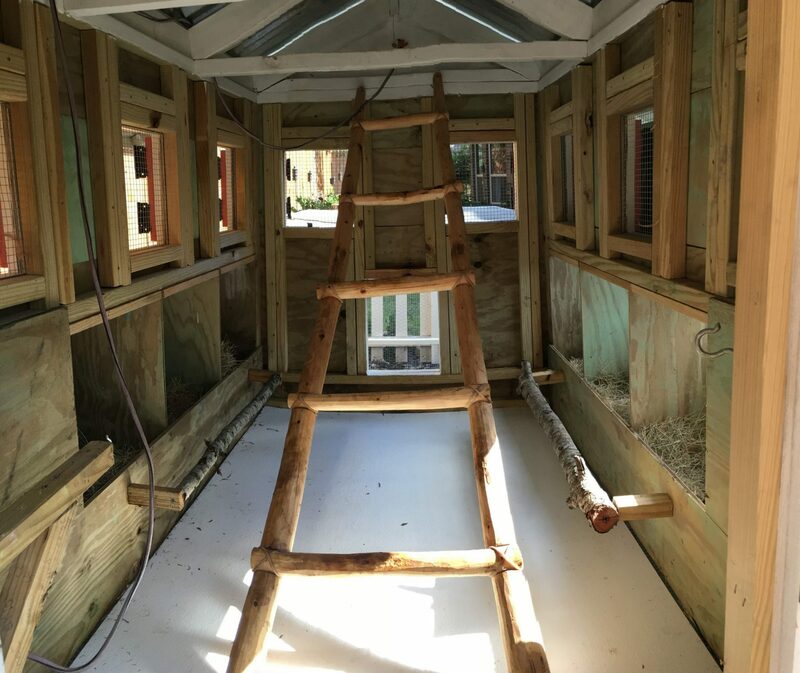 After all, you will be cleaning bird poop 🙂 We added a light on the front to help balance things in the winter months and make egg gathering at night easier. So far we haven't had to repaint anything but this day will come. Remember….just have fun! 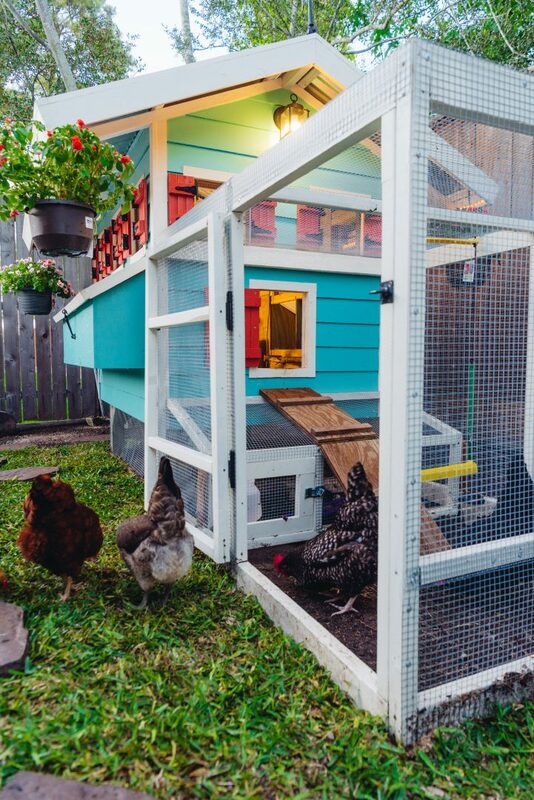 The coop will get dirty and it is ok. 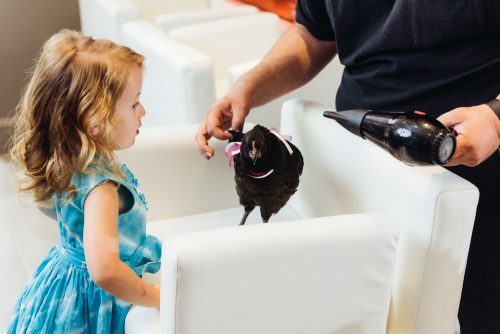 This is a great family project and a good way to teach kids how to take care of pets. Don't buy pre-made coops, they are expensive and fall apart fast. 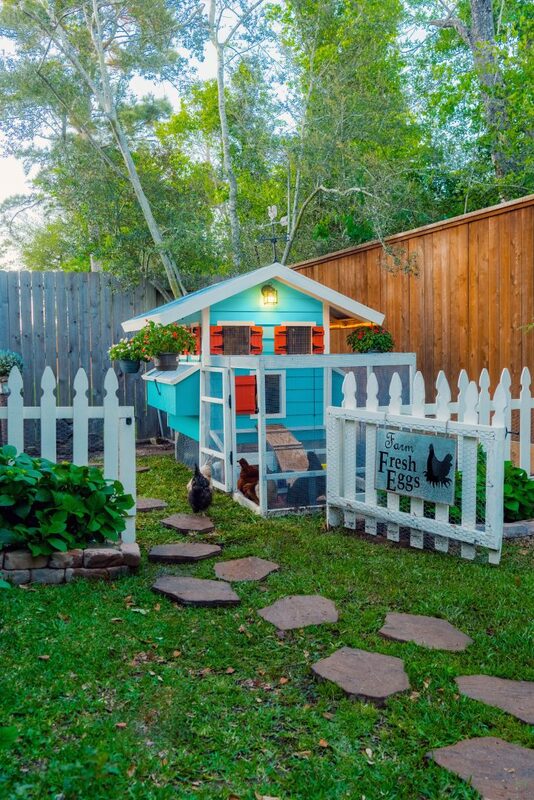 Don't be afraid to express yourself, this coop looks nothing like my house. Create storage space, I have 3 nesting boxes on each side but only 2 the birds can reach. Make sure there are no poisonous plants near your chicken space (yes hydrangeas are poisonous to chickens and yes I have them lining the fence near them. Mine never touched them and to note, I wouldn't plant this way again). Size your run appropriately, mine is technically too small. Provide plenty of roosting space. Place ridge vents or some way for heat to release through the roof while still making it predator proof. 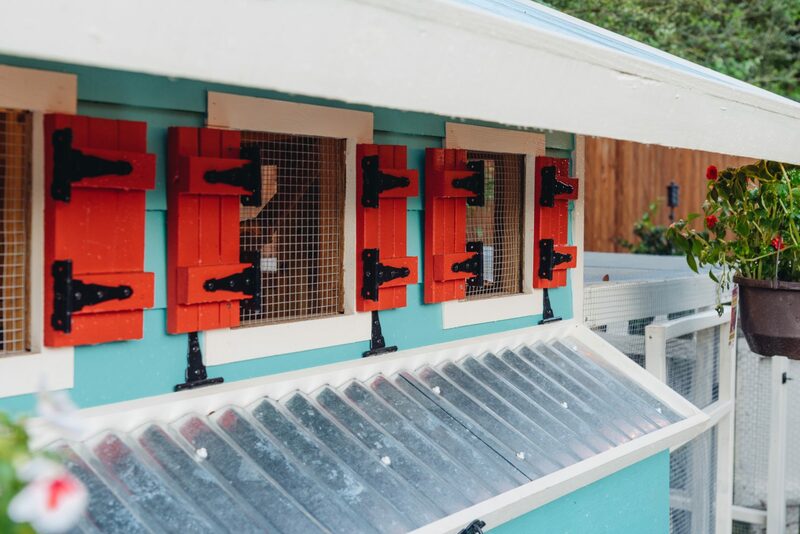 Want to see more backyard chicken coop plans? 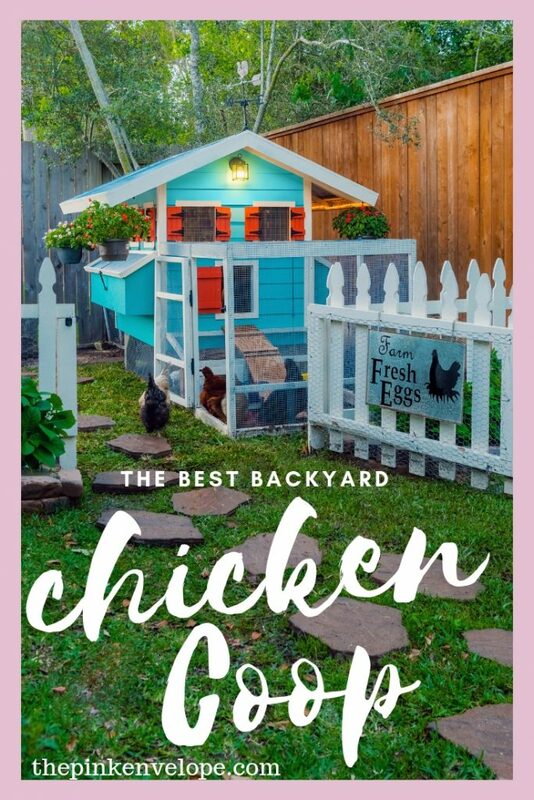 Check out here 57 DIY Chicken Coop Plans in Easy to Build Tutorials. Does #10 look familiar? It's the coop I got my inspiration from! 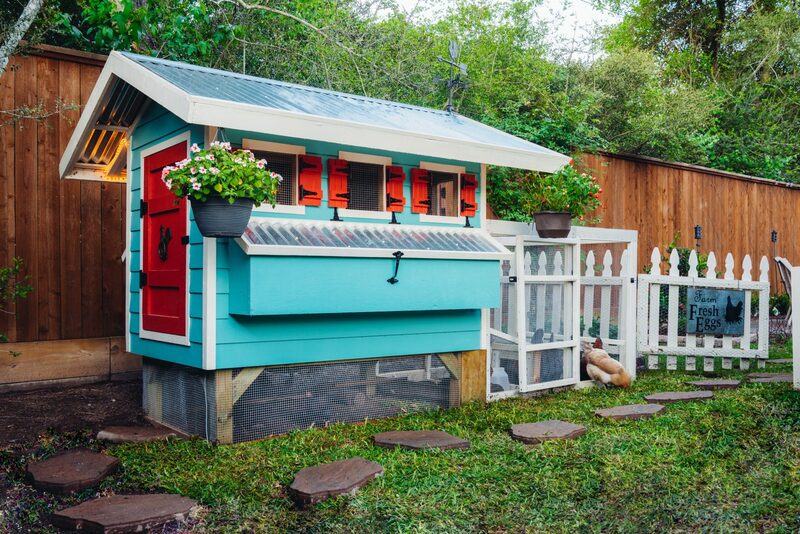 #2 and #13 are two of my favorites and ones I looked into building and someday I hope to add a rooftop garden to my current one just like #40. #41 looks a lot like my 1st coop I bought from Lowe's that was a bad investment, it fell apart and fast. Will never buy a pre-made like that again. I can’t believe that Fella is so good – the pictures are just precious. Thanks so much for sharing. Gotta go now – need to check out Fluffy Layers.